Maybe they’d play better if they were still behind. … Auburn is a pretty tricky team and with a week to rest, Georgia will get the Tigers’ best. Plus, you have to think about where this team’s head will be once it finds out what happened with South Carolina. How will this team react if it trots out onto the field and sees that South Carolina has beaten Florida? That absolutely puts Georgia in a must-win situation. Um… maybe I’m missing something here, but haven’t we just spent the last eight weeks watching how Georgia would react to being put in a must-win situation? This seems like kind of a waste of resources. Former ESPN play-by-play announcer Ron Franklin will be the guest speaker at tonight’s New Horizons Credit Union-1st and 10 Club meeting at Heron Lakes Country Club. The meeting begins at 5:30 p.m., with dinner beginning at 6. Franklin was reunited with former ESPN colleague Mike Gottfried over the weekend to broadcast the Samford-Chattanooga football game. The two men were partners for several seasons as ESPN’s top college football broadcasting team. If Uncle Ron says he’s really, really sorry and won’t condescend to women again, can he have his old gig back? And if that doesn’t work, I’d take him in Athens in a heartbeat. Hells yeah, the stat watch is on this week. Hold opponents under 17 points per game. As a team, Georgia is yielding 19.9 ppg. Finish at least +8 in turnover margin. Georgia’s turnover margin is +8. Average better than 380 yards per game on offense. Georgia’s offense is averaging 428.8 ypg. Aside from scoring defense (hey, that’s the SEC’s term for it; don’t blame me), the Dawgs are on track. SEC presidents may be greedy, but at least they’re not stupid. South Carolina’s president says the SEC will go to a nine-game conference schedule in the wake of expanding to fourteen schools. That’s a win for the fans. … For a conference title game, the NCAA requires leagues to have balance in both divisions. With a 13-team league, the SEC would have been required to apply for a special waiver to hold the annual game in Atlanta. UPDATE: Hold that thought. Maybe they are just a bunch of greedy morons. Shorter Stewart Mandel: Expansion will be the downfall of the SEC because they don’t know how to tailgate in Missouri. 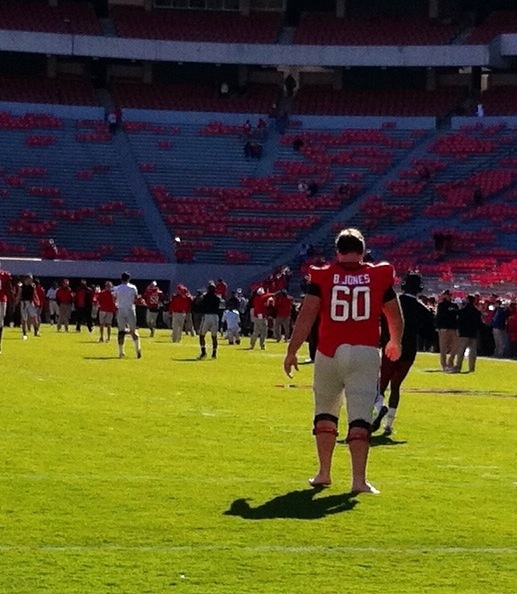 One more pre-game picture from Saturday: Ben Jones walking barefoot through the Sanford Stadium grass. There’s something truly marvelous about Will Muschamp calling out the rest of the conference after Florida squeaked by Vanderbilt at home to end a four-game losing streak.